Hark the Trumpet Sound: All the Bright Places Releases Today! 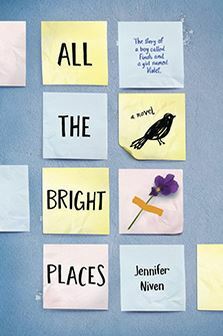 Everyone grab your tissues and head to your nearest Barnes and Noble because All The Bright Places, our Founder and Editor-in-Chief Jennifer Niven’s premiere YA novel, releases today! 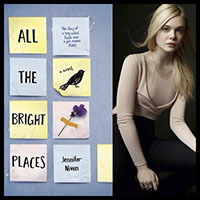 Highly anticipated in the YA community and being referred to as “The next Fault in Our Stars and Eleanor and Park,” All The Bright Places is the story of a boy called Finch and a girl named Violet. They meet under dire circumstances on top of their school’s bell tower, and from there they continue to help one another get through each day. A school project is what first brings them closer to each other, but their relationship soon develops into something more. What really makes All the Bright Places great is that Finch and Violet’s love story is heart-warming, heart-wrenching, and very real. They are incredibly organic and original characters that complement each other, even with all their flaws. A great thing about this book is that it deals with the issue of mental illness, which is very rarely presented in modern media. I believe the book itself will be a great learning tool for anyone who may be struggling with mental illness or for people who know someone who is struggling. Niven was inspired to write ATBP because of personal experiences with an old friend, which makes the story all the more genuine. 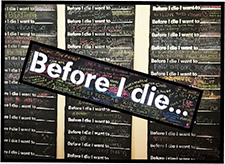 Although this book has its painfully sad scenes, it is also filled with hope, teaching us that we can learn and grow even through our heartache. I don’t want to spoil anything about the book, so I’ll just say in conclusion: read this book. It is an emotional roller coaster (as most Jennifer Niven books are) as well as being funny and relatable. It’s hard to put the book down, and the characters are alive and lovable. The long and short of it is: All the Bright Places is truly lovely.